About Manchester, useful recommendations for restaurants, shopping spots, activities, attractions and the accommodation options are listed. The first thing that comes to mind when you mention Manchester, is the famous football club Manchester United. But Manchester has so much more to offer than football. This is the second most populated area in the United Kingdom and is quickly catching up to London. Many of the younger generation that live in London are moving up to Manchester because it’s a vibrant city with great opportunities. The city is home to three universities, it has a bustling nightlife and a choice of gourmet restaurants. The city has a busy business hub and offers some of the most fantastic shopping experiences in the North West. The city is made up of a number of different districts and towns, all easily accessible using the extensive public transport network. It isn’t only the younger generation that have turned this popular UK city into their home, with so much to offer Manchester has become one of the firm favorite places to live in the United Kingdom. 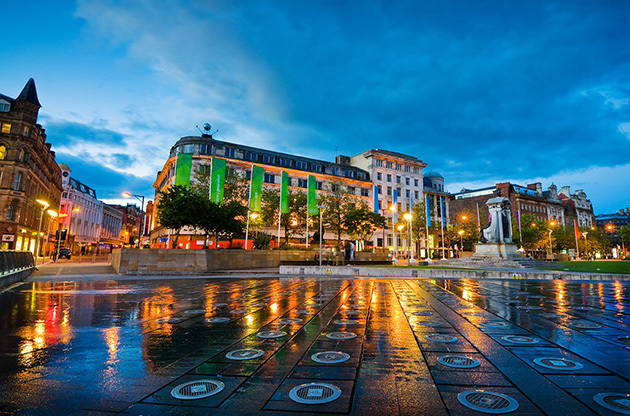 From Manchester you can access a number of different areas within the northern half of England, visit the beach or explore the quaint market towns. For those travelling on business there are a number of great hotels catering to the business traveler and getting around within the city is easy and simple. Most people use the tram or bus service, which is affordable, fast and easy when getting around within the city limits. Manchester welcomes visitors from around the world from families to couples and younger groups to business travelers. Manchester is a large city located one hundred and sixty miles from London in the central North West area of England. Manchester Airport is a large airport located to the south of the city, about ten miles from the city center. It is the largest airport outside of London and has three terminals and a choice of transportation options to take you to your hotel. The bus is the most popular option. The buses run every thirty minutes and then run twenty four hours a day. The Stagecoach no. 43 will take you from the airport directly into the city. There is also a regular train service and many visitors choose a taxi service which can drop them at their hotel entrance. One of the main attractions that draws thousands of visitors each year is the Manchester Museum. Spanning over four floors with fifteen permanent galleries, the this museum is a must see place. The museum opened its doors in 1821 and offers a range of artefacts from anthropology, zoology and more. The Chinese Arts Center is an interesting place to visit with a number of pieces on display. This contemporary Chinese arts gallery is one of the most visited attractions in the city. Finally, you really should take the time to have some fun at the Museum of Science and Industry, an interactive museum with 3D and 4D experiences to take advantage of. Manchester is a shopping hub in the north western area and has a number of shopping centers to choose from. The Arndale Shopping Center is a must for anyone looking for a day of retail therapy. This indoor mall is home to high end stores and food markets offering a wide variety of items. Another must is St Annes Square. This area is filled with expensive high end shops from jewelers to shoes and clothing stores. As you can imagine as a busy city, there is no shortage of delightful dining options. One of the top choices is Michael Caines Restaurant in the Abode Hotel. This restaurant offers a modern English menu carefully created by this Michelin Star chef. Real ale pubs are very popular in the city, as are the bustling nightclubs. You can choose to dance the night away at Tiger Tiger or enjoy a relaxed ale with great company at The Angel Pub in the trendy Northern Quarter. One of the most picturesque towns is Chester, complete with cobbled streets, great shopping and a host of delightful coffee shops. Another day experience is a bus ride to the famous Blackpool. Blackpool is a seaside area with a beach, pier, pubs and restaurants. During the summer months Blackpool is filled with holiday makers from around the country. During the winter months it’s a busy seaside location where you can sit back, relax and enjoy the fresh sea air. Take an open topped bus tour through the city and see the sites you haven’t explored yet. This red bus leaves from the Manchester Tourist Information Center and makes its way through the city streets, past the Manchester Football club, the University district, The Imperial War Museum and more. Manchester is home to numerous annual events which draws thousands of visitors to the city center. As a host city, it offers a wide variety of activities and entertainment. The world class hotels with remarkable facilities and the fully equipped venues make Manchester one of the most exciting business and academic events destinations such as conferences, congresses, symposiums, fairs, exhibitions, tradeshows and symposiums.